If, like myself, you find the idea of being snowed in in a remote pub an absolute dream, then this place is probably your best chance. 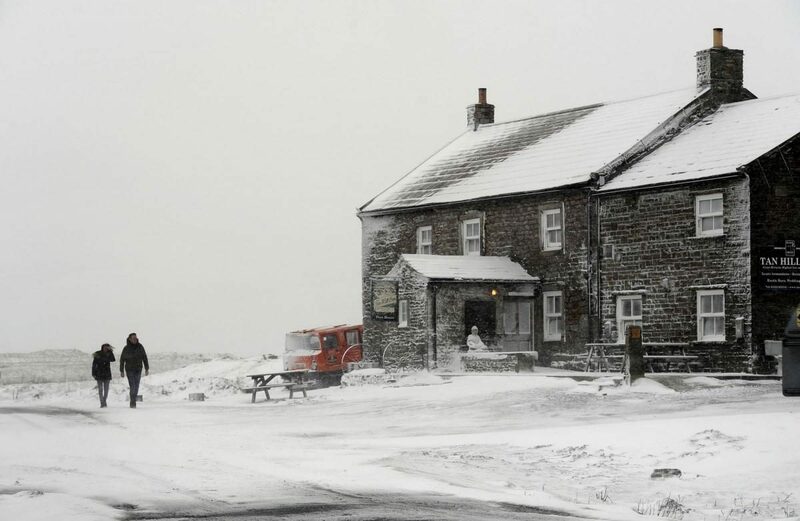 Sitting 1,732ft above sea level between the borders of County Durham and Cumbria is Britain’s highest pub – the 17th century Tan Hill Inn. The pub is known for its starring role in the 1985 Everest double glazing advert, but now the inn has a new claim to fame as the setting of the 2017 Waitrose Christmas advert. The theme of the ad sees a group of locals meet for a Christmas morning drink before becoming stranded in the pub and pulling together to put on a festive feast. Lovely. It’s not surprising that this particular pub was chosen for such a concept given that it has been snowed in more than 50 times in the past 12 years, according to landlady Louise Peace. The ringing in of the New year 2010 saw customers cut off by snow for 3 days – although Louise says the longest she has found herself stuck is 11! The pub offers a unique venue for visitors to take in the remote beauty of the Pennine Way, with the nearest town of Kirkby Stephen a 12 mile drive away. But if you do find yourself caught in the weather on your way up, have no fear, the staff of the Tan Hill are fully prepared with their caterpillar-tracked, Theakston’s adorned bus. During the New Year snow storm, staff made no-less than 17 rescues in 70mph winds with Louise herself eventually being snowed out of the pub, leaving 2 staff members to tend to the 60 marooned guests. Although subsequent reports point to everyone involved having had a whale of a time. If you’re thinking of a visit, the pub is open everyday of the year with a roaring fire and 6 hand-pulled ales to welcome you from your trek. And who knows, as the pub was placed on the market earlier this year, if you really love it you might find yourself wanting to stay. Just remember to take a shovel! Click here for Britain’s top 10 altitude-defying pubs. ← Previous Post Newcastle – Best City in the World!